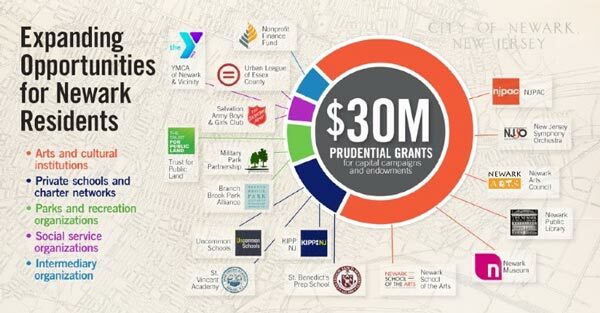 (NEWARK, NJ) -- Newark Arts is one of 17 Newark nonprofit organizations to receive part of the $30 million in grants from Prudential Financial, Inc. (NYSE: PRU) to fund capital campaigns and endowments throughout Newark’s five wards. Newark Arts received multi-year funding totaling $500,000 to strengthen its neighborhood granting program. The funds will foster Newark Arts’ mission to power the arts in Newark and sustain its place as a vibrant arts hub through community engagement and collaboration, with a specific focus on ArtStart-style granting outside of downtown. This work is directly aligned with the citywide cultural plan, Newark Creates, that Newark Arts has led for the past two years. “Thanks to Prudential’s generosity, we will be able to award even more funding to people and organizations that are providing critical arts and cultural activities in Newark's neighborhoods,” said Executive Director, Jeremy Johnson. “This grant will reinforce the citywide cultural plan, Newark Creates." With a focus on meeting critical needs of organizations serving Newark communities, these awards are in addition to Prudential’s annual grant-making budget and build on the more than $1 billion the company has committed toward the revitalization of its home city in the past decade alone. Newark Arts is a 501(c)(3) nonprofit organization which powers the arts to transform the lives of those who live in, work in, and visit Newark. Newark Arts is the umbrella for the Newark Arts Education Roundtable (NAER) and is a partner with the Mayor’s Office of Cultural Development, Arts, and Tourism. The Council awards neighborhood grants through its ArtStart program, produces the Open Doors Citywide Arts Festival, and will oversee Newark’s Community Cultural Plan in 2017-2018. Prudential Financial, Inc. (NYSE: PRU), a financial services leader with more than $1 trillion of assets under management as of December 31, 2017, has operations in the United States, Asia, Europe and Latin America. Prudential’s diverse and talented employees are committed to helping individual and institutional customers grow and protect their wealth through a variety of products and services, including life insurance, annuities, retirement-related services, mutual funds and investment management. In the U.S., Prudential’s iconic Rock symbol has stood for strength, stability, expertise and innovation for more than a century.